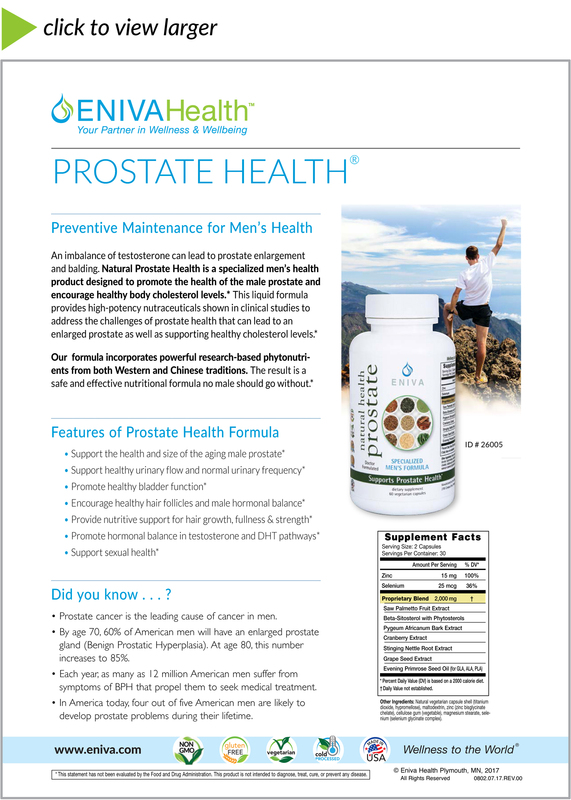 Eniva® Natural Prostate Health is a specialized men’s vitamins health product designed to promote the health of the male prostate and to encourage healthy hair follicles through shared hormonal pathways. * This formula provides nutraceutical ingredients shown in clinical studies to support the health of male physiologic mechanisms: • Prostate Health • Urinary Flow • Male Sexual Organs* This product joins our line-up of liquid supplements as one of the best multivitamins for men on the market today! An imbalance of testosterone can lead to prostate imbalance and balding. This common stimulatory hormonal pathway involves derivatives of testosterone, namely DHT (dihydrotestosterone). With this stimulation comes a cycle of undesirable prostate and hair follicle irritation. Eventually, this can lead to undesirable health outcomes. What is the Male Prostate? • The prostate is a small organ approximately the size of a walnut. • It lies below the bladder (where urine is stored) and surrounds the urethra, the tube that carries urine from the bladder. • The prostate plays a key role in proper sexual function and also helps protect against bladder infections. A key stimulating and potentially irritating hormone to both the prostate and hair follicles is a derivative of testosterone known as dihydrotestosterone, or DHT. Other male (androgenic) factors also play a role. Once simulated, the irritation cycle leads to damage of tissues. 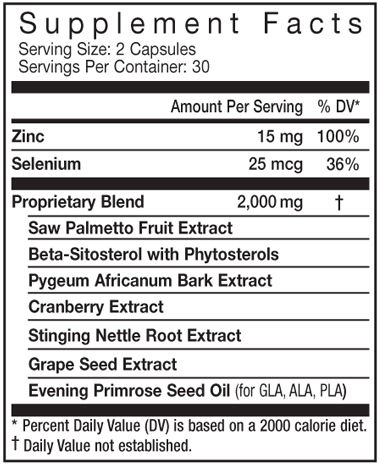 Phytosterols with Beta-Sitosterol: A purified plant substance that is the main, active sterol found in saw palmetto, pumpkin seed, and pygeum. Similar in its action in the prostate and hair follicle to saw palmetto and pygeum. Lecithin: Lecithin supports cellular integrity and healthy body tissues, such as skin and hair. • Most studies indicate a noticeable difference will be seen between 4-6 weeks. At a minimum, an individual who is integrating a complementary approach should stay on their program for at least 6 weeks before evaluating whether or not there has been improvement. • As always, be sure to include your personal professional health care provider in the decision to use complimentary nuetracutical products. • It is recommended that individuals who have liver problems/disease do not consume products containing herbal components unless first checking with their qualified healthcare specialist. • 50% of men over age 40 experience prostate problems. • By age 70, over 60% of men will have an enlarged prostate gland. At age 80, this number increases to 85%. • 70% of adult men will have to make lifestyle changes due to an enlarged prostate, necessitating a visit to their physician. - Many physicians are now recommending complementary therapies in addition to classical treatments for BPH. The mainstay of these therapies are nutraceuticals containing botanical extracts. Data on file, Eniva Corporation, 2015. Ingredients: Natural vegetarian capsule shell (titanium dioxide, hypromellose), proprietary blend, maltodextrin, zinc (zinc bisglycinate chelate), cellulose gum (vegetable), magnesium stearate, selenium (selenium glycinate complex). Directions: Adults: 2 capsules daily (1 capsule AM/ 1 capsule PM) or as directed by your health care professional. Storage Directions: Avoid freezing, heat and moisture. Caution: Do not consume if tamper resistant seal is broken/missing. Do not consume if allergic to component within product. As with all dietary supplements, contact your doctor before use. If taking prescriptions, have ongoing medical condition, pregnant, nursing or under age 18, consult doctor before use. KEEP CAP TIGHTLY CLOSED. KEEP OUT OF REACH OF CHILDREN.